Please note: The digital edition does not include 2 of the 6 images that appear in the physical edition. The personal computer has revolutionized communication, and digitized text has introduced a radically new medium of expression. Interactive, volatile, mixing word and image, the electronic word challenges our assumptions about the shape of culture itself. This highly acclaimed collection of Richard Lanham’s witty, provocative, and engaging essays surveys the effects of electronic text on the arts and letters. Lanham explores how electronic text fulfills the expressive agenda of twentieth-century visual art and music, revolutionizes the curriculum, democratizes the instruments of art, and poses anew the cultural accountability of humanism itself. Persuading us with uncommon grace and power that the move from book to screen gives cause for optimism, not despair, Lanham proclaims that "electronic expression has come not to destroy the Western arts but to fulfill them." 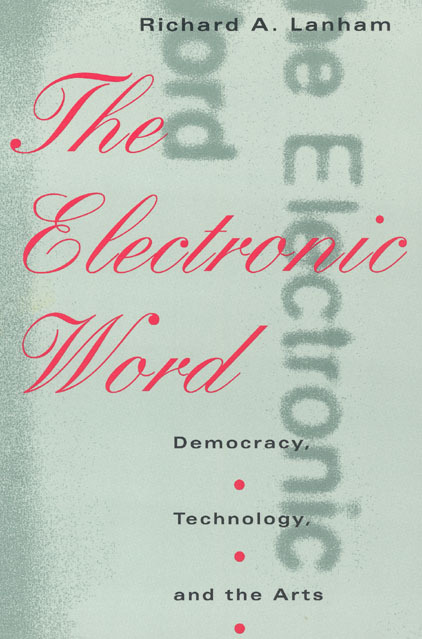 The Electronic Word is also available as a Chicago Expanded Book for your Macintosh®. This hypertext edition allows readers to move freely through the text, marking "pages," annotating passages, searching words and phrases, and immediately accessing annotations, which have been enhanced for this edition. In a special prefatory essay, Lanham introduces the features of this electronic edition and gives a vividly applied critique of this dynamic new edition.